Weekends are a great time for cooking and nothing beats the aroma of a home made pie baking away in the oven. 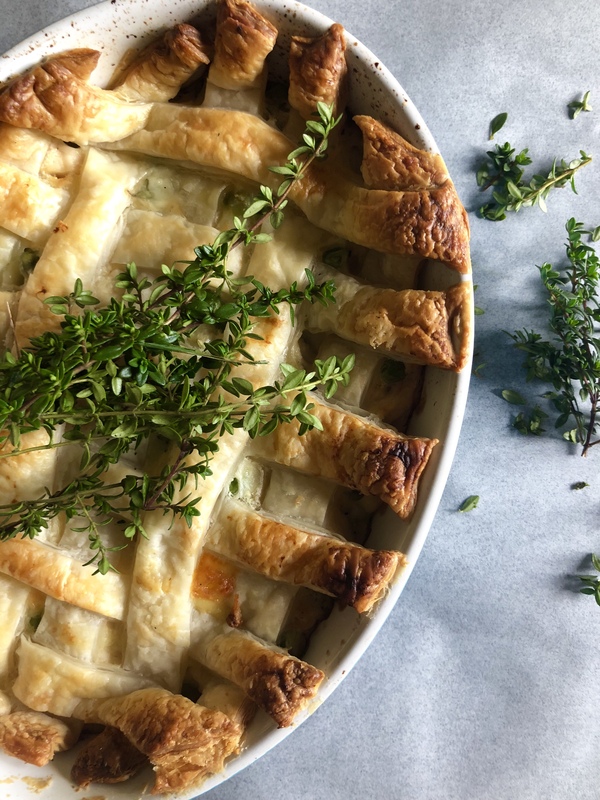 With golden puff pastry, creamy chicken filing and fragrant thyme this delicious pie recipe is a real crowd pleaser. Preheat oven to 180 degrees Celsius (350 Fahrenheit). Melt butter in a saucepan over a medium heat. Add flour and stir for 1-2 minutes. Gradually add milk being sure to stir continuously until a thick white sauce forms. Season with salt and pepper, remove from heat and stir through cubed cheese. Add blanched peas, chicken and thyme leaves (removed from sprigs) and stir through. Spoon chicken mix into a small-medium sized pie dish or ramekin. Layer puff pastry strips on top in a lattice pattern. Brush with a little milk and bake in oven for approximately 20 minutes until pastry is golden and filing is piping hot. Serve with some extra sprigs of thyme and enjoy! ELE tip – this recipe serves 2, to make a larger family sized pie simply double the ingredients and bake in a larger pie dish. This looks so yummy I’m going to have to save this recipe for winter and give it a try! That looks great. Thanks for sharing your recipe. Sounds easy enough. It sure looks tasty.